I got a Raspberry Swirl Little Fella from Junior's for my birthday. 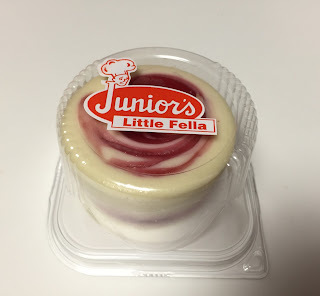 I thought of a slice of cake but this mini version of a whole cake looked nicer. As I was looking for something pretty, I got this Raspberry Swirl which was the last piece when I went to the shop. 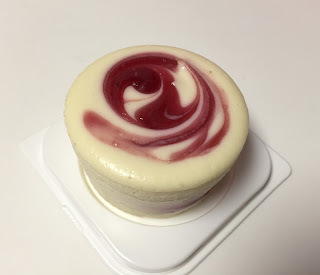 On the top, there're beautiful raspberry swirls. I thought the raspberry was only on the top, and it's a nice surprise that inside of the cake, there's raspberry sauce, too. 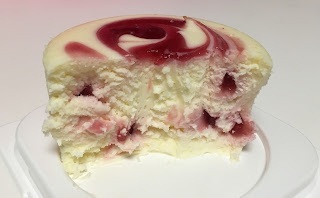 I enjoyed the sourness of cheesecake and fruitiness of the raspberry.